There is nothing new about New App. 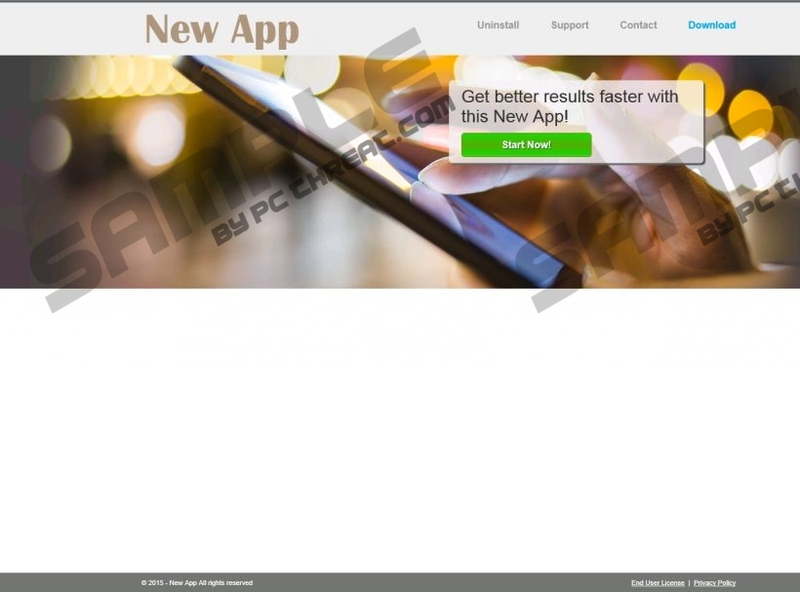 This adware application belongs to the SuperWeb family of potentially dangerous programs that most often arrive at target systems bundled with freeware. In other words, you definitely need to remove New App from your system, but you also should look for other applications that should not be allowed to remain on your computer. New App may not be the most dangerous application out there, but these days even the most innocent looking app could eventually lead to a serious computer security issue, especially if they get exploited by malevolent third parties. If you happen to come across the official website for New App via getmynewapp.com, it may seem as though this application is a useful tool that can improve your web browsing experience. Nevertheless, it is not possible to download New App from the official homepage, and that does not come as a surprise for us because that is common to all the SuperWeb applications. It was not possible to download directly Coupons Free, Information Cloud, iShopper, and many other browser extensions from the same group. We can basically say that the official websites are there to trick unsuspecting users into thinking that New App is a reliable tool one simply must have. However, New App may not be as useful as it claims to be. For one, this app gets installed as a browser plug-in once it enters your computer. However, the application seems to work on Internet Explorer and Mozilla Firefox only, as the newest Google Chrome versions are not compatible with New App. If you try to add New App to Google Chrome, the browser says that the plug-in has some vulnerability that might cause specific computer security issues. Technically, this should be enough to convince you that New App should not be installed on your computer. However, users often fail to see that adware programs can be used as tools in malware distribution networks. For example, the New App ads you see on your screen whenever you access online shopping sites could be embedded with outgoing links that lead to dangerous web pages. It is not New App’s intention to infect you with malware, but the program cannot do much about it because it does not review the third-party content that is promoted in its ads. Hence, to protect yourself from any potential security issues, you must remove New App right now. Don’t forget to terminate other unwanted applications that might have arrived together with this adware program. Finally, to ensure that your computer is fully protected from malware, invest in a legitimate security tool. Select Uninstall a program and remove New App. Go to Uninstall a program and remove New App. Go to Add or remove programs and uninstall New App. Quick & tested solution for New App removal.